Back to work yesterday after the holiday break (thanks for your patience) and the first place I went was the Chelsea Flea Market on 26th street. That has always been a great place to shoot and to just wander around for an afternoon. At every flea market at seemingly every booth are boxes and boxes of old photos. I rarely sift through them because they are such a chaotic mess (the same reason I have no patience for tie sales). Well yesterday was so cold I was looking for any reason to stay inside that toasty garage of a flea market. Without thinking I flipped through a few photos in a shallow box bursting with photographs and after a few moments I found this top image. I was immediately charmed. The style of the clothes, the love of family, the spontaneity of the image all work to capture everything I love about photography. I mean come on, these guys are impeccable – the 3-piece suits, the crease in the pants, the quality of the shoes, the boutonnieres! Who are these people! I also love that you can tell these are just ordinary family photos of some important event and not some onetime sitting for a professional family photographer. Notice the the negative in the top image is reversed. No suit that nice would have had the breast pocket on the righthand side or the boutonniere there either. Yes, I was feeling very CSI during this discovery. However, box I was looking through was such a jumbled mess that I never thought i would find another image from this family but after a few more handfuls of images I found another image, and then another, and another. It was so exciting having this human story unfolding in front of my eyes. I was trying to find clues that would tie them together, like the facade of the building in the 2nd and 5th picture. Of course you start creating your own fantasy about these people. Where are they from? Are any of them still alive? Was the style of this generation carried on to the next? Where did they shop? What did style and fashion mean to them and how did it help them fit in or alienate them from their neighbors? The not knowing actually is more fun, it gives you so much more freedom to imagine. I LOVE old photos so don’t be surprised if this becomes a more regular feature on this blog. Notice the squared-off bottom of his suit jacket. Notice the supertiny tie bar on on the gentleman second from the left. I love that these images were taken over several years. This gentleman looks several years younger here than in the top photo. It gives me hope that somewhere out there are even more photos from this family waiting to be discovered. I asked the woman I bought these from to search her other boxes of photos at home to see if she had anymore. I’ll keep you posted. i love b&w fotos… lovely! My God how beautiful and elegant they are! Please feature more, we or rather, I need a break from all the fashionistas of the world. This is true style and style cannot be bought or manufactured. You either have it or you don't. Clearly, these people had IT. those pictures look like they're at washington university in St. Louis. yes?? These pictures were taken at City College in New York City. Perhaps they lived in that area. (139th Street and Amsterdam Avenue). Thank you for giving space to images of black America not regularly seen from a period where there are so many negative ones. Mad style! Are you sure you didn't take the 2nd picture posted?! It is totally your composition and style!!!! Great pictures-thanks for sharing your treasure. Happy New Year. The building in the background looks very much like the buildings at City College in Manhattanville. Gorgeous, im sure i have family pics like this hidden somewhere deep down in a box of who knows what.Now off to find them..
As Oscar Wilde noted, all beautiful things belong to the same era. Thanks for showing great style naturally lived. I love the pictures and I love the story! Brilliant photos. I love that you've brought them back to life. Welcome back! What amazing pictures. And I'm sure that before too long people will have discovered or come up with all kinds of info about this family. I remember someone found some Edwardian photos inside a book they bought, put them up on a forum and within a week had identified the house, the family and even the living descendents! What beautiful photos of a beautiful family. I wonder about the back story, how these photos ended up in a box at a flea market, instead of the family photo album. Wouldn't it be great if someone saw these here and recognized a family member? WOW! They look amazing! Wish I came from such stylish backround! Please try to find more pictures of them and most importantly who they are. I know it's more romantic this way, not knowing, but please, please, I just need to know! These photographs are amazing. The gentlemen are very handsome and charming. But what about the ladies. They are also georgeous. This is a seriously stylish family. It would be a lovely story if this family would be recognized by somebody and you would make a before and after story about them. I like it a lot when you write long stories. I hope that beside old photographs you would do that more often. Happy new year Sart. Glad you are back. I have been following your blog on a daily basis for years now and I can not wait for the surprises you have for us in 2010. WOW!!! Who is that family? Is it mine? Is that my great grandmother? (just kidding) Were they pimps? Were they educators? Who are they! I love a stylish family! Those men were so suave!!! At the moment I opened your page my Itunes played Moon River from good old Frank Sinatra – and this just fits beautifully to the mood of these amazeing pictures. thanks for sharing such a wonderful discovery. I love vintage photographs and really look forward to seeing this becoming a regular feature! I like Annka's story. Maybe a nice soundtrack for the movie you should make about the search for this fashionable family! That is definitely City College in the background. Welcome back, these pictures are great! Lovely pictures !! And …Happy new year day!! Agree- Wash U in St. Louis. actualy looks like these photos were taken at city college in harlem. Simply takes my breath away… There's really nothing else to say because these beautiful pictures speak for themselves. Great way to start off the New Year. The building in the 2nd, 3rd & 4th photos is Shephard Hall of City College! What class! Happy New Year! What a perfect retrospective on starting a new decade! You are the BEST!! !I love old photos, old movies and the style of the period of the 40's, 50's….we do not see it enough. The fur and detail on the suiting is amazing. there's an art to finding smething when you're not looking for it-serendipity-greeting from croatia, ineida. GORGEOUS!!!!!! I bet he was a pastor!!! I LOVE old photographs!! !My Grandma still has some from the old days which means Czechoslovakia in 1930's and up..They used to be a well-known family but after the Second World War eveything has changed..Looking at those pictures now reminds you the good times as well as the importance of being still alive surrounded by the most important thing – family. i agree , i love b&w photos like this … ! Finds like this just don't happen enough! I've a feeling this was meant to be. The cold weather getting you to inside the market, getting you to look in that box. I've a feeling you will find out more about this family……. well, I hope you do anyway! Looking forward to this being a more regular thing. These images are amazing, they look so stylish and happy. A pleasure to look at! These are some great photographs. This reminds me of the pictures of my family that i have seen from the 50's. Gorgeous family, gorgeous photos. Perhaps fodder for Sart Book Two? Speaking of which, I bought your book yesterday, and love it. What a jewel. Well done! I think they're at Duke University. At last!! You do not imagine how have I missed your pictures! What a great-looking, stylish bunch! Great post. I would love it if old photos became a part of the regular season. I really love when you write as much as in this post too. Thanks for sharing these great vintage photos…I love them! I do wish that someone who actually knows who these people are would read this post. awesome!!! You know. Every time I think I am over this blog; you post something like this. I love your passion for photography and fashion. I love that you can say things about a photo that I feel and you ignite a fire in me to start photography; to find the fun in the mundane. I like the attitude of the pictures, aside from everything you said, it seems problem free, fun, carefree and there is an element of worth of self in the pictures. All pictures of myself have a sort of self conscious vibe to it so I'll always be looking for that in pictures. This guy looks like he knows something in all his pictures. Sort of the way Mona Lisa has a secret smile. Like he knew his pictures would be discovered. Wouldn't that be fun; having pictures and then putting them in flea markets years later. Thank you for such an inspiring post and welcome back! How wonderful that these images came so close to being flotsam and are now immortalised as street style icons. Nice reflective start to the new year! There is alot of soul in these photos, and a well dressed family. I can always apriciate a bit of history. The exhibition in the national museum of american history DC, features more than 100 images created by one of the premiere African American studios in the country and one of the longest-running black businesses in Washington. I was happy that you took the time off…. I worry that you need more time to your self!!!! Yes, this is when fashion was just an organic process and not a competition!!! Such a beautiful group of people! I'm old enough to remember when people of all ilk dressed like this EVERY DAY! Imagine! But the very best aspect of these photos is the sense of friendship (perhaps family love?) and un-selfconsciousness they exude. Cool, thanks for sharing your great find. This family is certainly stylish. wonderful! who ARE these wonderful people indeed. they are so stylish and proud and beautiful, with that old-school charm that seems so hard to find these days. love it. …in Paris it is very common to find not only old family pictures, but entire family albums on flea markets! I have bought them sometimes, and it is amazing to observe the past clothing styles but also to see growing older the persons while going through the pages.. It sure does look like City College. Whether or not CC had anything to do with the event they were memorializing these folks have such a sense of style they could easily have walked over to take advantage of such a perfect background for their pics, summer or winter. 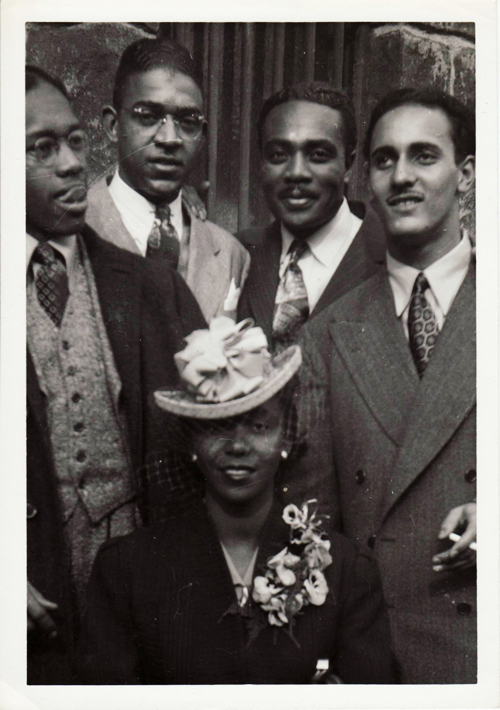 They're give me so much Harlem Renaissance…. wait! Could it be?! I already commented on these pics earlier this morning…but I had to do it again. I love them!!!! This should definitely be a feature on your blog!!!!!!!!!! I love that veiled hat…I wish we dressed up for dinner like they did in the old days! These photos were undoubtedly taken at The City College CUNY in Harlem on Convent Avenue.The beautiful architecture there is worth the trip uptown. What a find, I find it so fascinating, these portraits of people – what is their story?! Wow! Wat a good way to start 2010! First, WELCOME BACK and Happy New Year! I can't tell you the number of times I came back to your blog hoping, wishing, praying for an update but still the same photo at the top. Sigh. The photos are absolutely amazing. What an excellent find. Although I do feel a bit saddened – after going through similarly old photos with my mother over the holiday – that an entire family's documentation has been left for strangers to weed through in a flea market. At least they found their way into your hands! Love the photos. The next to last one is my favorite. It reminds me of my father. He used to wear his clothes just like that. He was slender and liked to look sharp. When my teenage son gets home today I am going to show him where the waistline for a properly worn pair of pants belongs. I too love old photographs. Thank you for sharing! It's funny that you should post about that flea market. I remember going as child with my father. I dug through the same boxes and proudly picked out two small photo albums – photos of a european trip in the 40's! I have often thought of the market and I couldn't remember exactly which one had yielded my delightful discovery. I'll have to check back during my next visit home. Thank you again! I subscribe to your posts, and this one was just like getting a letter from a good friend. The guesswork makes me happy too, and I hope you unravel more of this fantastic history. I completely approve of your old photo idea — I LOVE them! In fact, I love them so much that I want to cry when I see boxes of them for sale when I go antiquing. It makes me sad because someone didn't have anyone to pass them on to, or that person didn't want them and discarded them. I always want to buy all of them so they have a home again! ur back! ur back! lovely pictures, who doesnt like vintage? more dignity and grace than anything else. happy new year! photos with a story! just beautiful. These photos are the reason I love fashion! The wide lapels…the pants at the waist with the pleats laying perfectly…slim knots and the small tie bar thru the shirt collar. Beautiful, beautiful coats with pretty ladies and handsome guys…you just inspired my next post! Thanks as always and do post more if you find them! Such amazing photos to be unearthed there. I love this idea and the use of the b&w photos! I look forward to more of the surreal life in fashion. Such a delightful collection of photographs! Wish I could say I knew who they are. Love this entire post, definitely looking forward to similar ones in the future. this retro elegance is simply amazing ..
the place where the latter part of the photos taken seem to be at City College of New York. That's GOOD work! Wonderful photos!Thank you, have a HAPPY 2010! These photos are great. Incredible! Tasteful and inspiring. Kind of reminds me of pics I've seen of my grand and great grandparents. Thanks for such a good post! I absolutely loved this post and would love to see more old pictures! Old pctures have a sertain magic thing to them I think, ah, how I wish I could have a wall coverd with them! Hope you find some more pictures of the family and good luck finding them! These pictures are truly great! These young educated students are a real testament to how my family and many famlies lived during that area.They exemplify great style. What a new year treat! Seeing a photo like this puts current style into a broader context. Hope you have more finds like this. And those hats!! Reminds me of photos of my mother who wore hats with such verve and energy. Thanks for recognizing something so valuable and sharing it with all of us. Upper class university students that came from hard working educated family that taught education, style and presence are images that always stand the test of time. Thank you for sharing! if you're really interested in old photos and style, check our bushwick's vortex. a plethora of images to sift through and find some treasures. i don't work there, so i can't speak on specifics, just a neighborhood local who loves stopping in from time to time, and adores even more, your blog, s. schuman, as a fellow indiana->nyc transplant. Happy New Year! I especially love the photo of the man with sleeves rolled up. 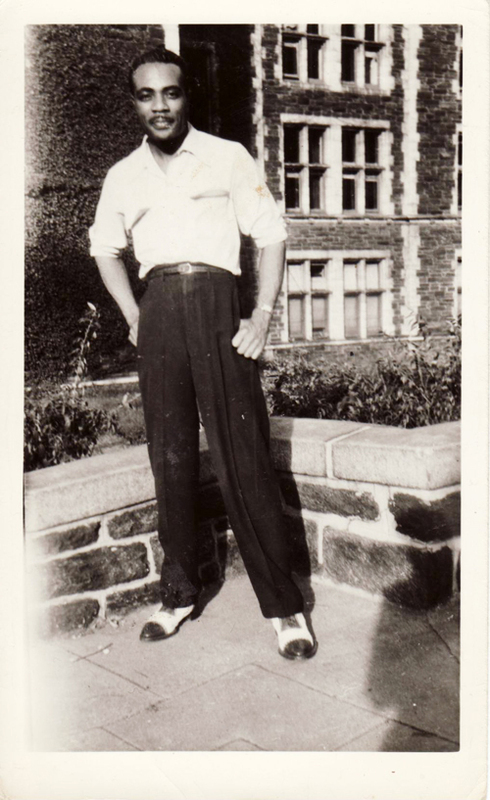 I have a ton of old photos from my relatives looking very stylish – what changed that so many people got so casual? Very stylish. They don't look like family. They look like college students. I'm also hoping someone recognizes them and writes to you. If these were in a book I'd buy it. I look at these photos and immediately think of Wallace Thurman's novel "Infants of the Spring." Although these pictures are set at least a decade later, I can see a Zora, a Langston, a Countee, a Wallace, and an Aaron. These are glorious photographs. A tremendous amount of pride flows from those smiles, the postures, the clothing, their eyes. Incredibly moving. Just stunning. Please continue to post them if you find more. These people must have descendants who are alive. If so, I hope they have similar photos for themselves, or that they somehow come across these! not only are the photos great due to B+W, fashion, etc., we are also looking at I'm assuming an African American family that was upper middle class, or even upper class, which was not very common during this time period, the history of the people/family is probably more fascinating than the tailored clothes. I am agreeing with the folks who say this is City College in New York. I live about a block away, and there is no doubt. These are such amazing photos, thank you for sharing them! Glad you're back. Happy New Year! Everytime I opened my fox I went to your blog and finally you have posted again! The photos and family are absolutely amazing. What a fantastic find. I hope we can find out who they were, though I love to imagine stories, I think this was a very special bunch. I'd love to know more about them. Please do make this a regular feature. I love the vintage photos. Fabulous photos and fabulous clothes. Thanks for sharing! nowadays you can be considered "dressed up" by wearing $300 faded jeans. so sad. it makes me wonder if 60 years from now our snapshots will have the same charm as todays vintage photos ("todays vintage", is that an oxymoron? ha). then again, there won't be boxes of old photos at swap meets by then. all our photos are digital. man, that just made me think: will there be "vintage blogs" someday. i mean, there's bound to be someone still running the same website for 20, 30…40 years (there are already sites that have been around almost 20 years). is that inconceivable? will there be such a thing as "internet archeology", where people "dig up" sites from decades prior? of course that information has to still be stored on a server somewhere. i don't know, just thinking out loud. Your cool factor just shot through the roof with this posting! I cannot contain myself. Thank you. They are lovely representatives of a very rare form of humanoids: The Well-Dressed American (WDA). Their species now considered critically threatened, the WDA once ranged over the entire continent of the U.S., and flew to many other continents to graze, reproduce, and show their finery w/o having an excessive attitude about it. The WDA was replaced over time by the Slacker, the Tourist, and the Middle American, whose dress is characterized by exuberant colours and washed out cotton clothing. (A subset can be found online on sites like People of Wal-Mart.) The WDA still exists in some narrow ecological niches, including as lobbyists and politicians (State and Federal only, with some local exceptions located mainly along the coasts in winter), Wall Street bankers, and big-city lawyer's offices. NYC is often considered a target-rich location for WDAs, but the casual observer often mistakes fashionistas for WDAs. Beautiful selection of pictures! :-) I love the hats and hat pieces ladies are wearing: they look so elegant, so well put together! Beautiful!!!!!! it's really very interesting, if someone is still alive… what they do…or what they did… it's kind surprising, why such family photos are on the market, and not in the family album…Anyway, they are gorgeous !!! There is something quite wonderful about discovering photos in a box at a flea, and realize there are more then a few that are related. Question: Did any of the photos have a date on the back? It looks like the 40s to me, based on the suit sillouettes, the ladies dress and coat styles, and the hat styles. Would love to know if any exact dates exist. I am a costume designer so the archeological clothing digs are my favorite! Lovely of you to share, so thank you. Thank you for posting these, they were nice to look through. And good luck in finding more! I feel like B&W makes everything just look super classy but these pictures would emit class even in color. Love the second to last image. wow. I'm very moved by these images. what style, elegance and charm. These really made me smile. Such timeless elegance that you rarely see anymore. This is why I find you inspiring as someone in fashion, you celebrate the most beautiful normality. Impressive personal style and a gorgeous family indeed. I always find it sad when family pictures are discarded. What happened to these people? Weren't there any relatives who wanted to keep these pictures? What a fantastic set of pictures! Who in their right mind would sell these on?! These people are so stylish and depict the era that they are from. I have some pics of my grandparents from the 1930's and 1940's and they look amazing – I think the law in those days was that you had to look fabulous, glamourous and elegant! I did not have time to read all of the 96 comments that came before mine, but I would imagine, with all your followers, and with the degrees of separation closing, that someone, somehow, might make a connection! I love their style, elegance, love and togetherness…love your appreciation as well. These are gold. Pure gold. Great find! These are just fantastic – thank you for sharing, and finding them! Those coats the ladies are wearing are stunning. Wish they made coats like that now. I have looked for two years for a new coat and I just keeping wearing my old one. Wow, what a mystery! So much fun to reconstruct a story. I love these photos and the spirit of family with style that they evoke. I am a CUNY student and I KNOW that's City College. I know that campus like the back of my hand! I seriously did suffer from withdrawal effects – thanks for posting again. Too many posts to sift through so if this has been suggested before I'll apologize but it might be a cool idea if, say, one day a week you ran a classic photo you have come across. You could then space them out so you wouldn't have to worry about searching for one. Not Yale or Duke or St. Louis or wherever. Anonymous at 11.08 AM is correct that it's City College in Harlem, New York, with Convent Avenue the street in the background. It's a beautiful little courtyard, and unmistakable to those who know it. Although like most public-funded institutions, it's gone downhill since the '80s, City used to be basically the free Harvard of America, famously the alma mater of Colin Powell and other greats. So maybe these photos are someone's Harlem Renaissance college years, the energy and care of the clothes reflecting the aspiration and egalitarian spirit of the school. I thought that the device securing the gentleman's tie in the second photo is actually a tie pin, not a tie bar. amazing, once again. they look like they could've been shot by a scott schuman from a different decade. and please make old photos a staple! i love them. PS: The building in the background is called Shephard Hall, it used to be City College's School of Architecture, among other things. You can see the beautiful interiors in Spike Lee's film The 25th Hour. glad to see this new feature. i've been collecting vernacular photographs for years and they are always a source of style inspiration. I have been following your blog since you started. and never i have i ever been so proud to be black as when you posted these a mazing photos. Thank you so much for being you, for your amzing eye, and your love of fashion and culture! A true labor of love…Thanks and happy new year. These are great. I found hundreds of photos like these at my grandmothers house. Some of them family members, other unidentified. Everyone had impeccable style. I guess that's where I get it from! I also am moved by the people in the photos and what their stories may be. Notice the body language in the top photo – the men are near perfect mirror images of one another. It is said that people mimic one another in body language when they are in sync, interested emotionally or romantically. I would have loved to have known these lovely people. Bravo! Fabulous first post of the new year!!! 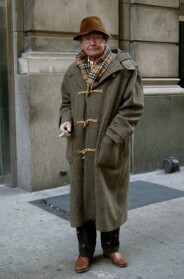 I often see an elderly gentleman on the 210 bus in Los Angeles who dresses this smartly. He always wears a dapper suit, tie, spit-polished shoes and a hat, which he politely takes off while on the bus. He looks FANTASTIC and he has inspired me to put more effort into my wardrobe. I am glad that you unearthed these pictures. Now they have a chance to become history- a chance they deserve very much. These images are lovely, and unexpectedly moving, because as I looked at them I thought about the context in which they were taken. They are so clearly about aspiration and dressing to fulfill a dream of the promised land. Now, with the very stylish Barack Obama in the White House, that dream has finally come true. Wow, that was great. Good detective work. Thanks, Mr. Sartorialist, for such lovely pictures. I imagine them as a Jazz group playing the speak easy! I love these photos! What elegant style and as one person said above, it's not fashonista style, it's real style that can't be bought. I love it! What a beautiful family of color, thank you for this! More more more! exquisite! welcome back… we've missed you. The background is definitely typical of an American university. I'm almost sure it's Cornell (West Campus) because I studied there, but I wouldn't be surprised if it was another College ! Many of them look the same, and that's what I looove ! First, WELCOME BACK and Happy New Year.. I would like to see this as a regular feature on your blog. It´s very inspiring with how today´s stylish people dress but as you said, one can makes up their own stories about the old photos. This has got to be my favorite post ever on this blog! My boyfriend and I found a 95 year old photo of his great grandmother and it took my breath away. I agree that the second photo is very much your style of photography. What a wonderful serendipity. The top one seems like a wedding? The others perhaps a graduation ceremony? Years ago in a picture frame shop i worked in, we used a series of old b&w pics from an unknown family, my boss bought at a flea mkt to sell the frames, one of them had this man smiling in his army uniform, then in his best suit, then in his garden, and with a girl..I hadn't thought about this for years…….makes you wonder!!! These pictures definitely made my return to work brighter. I love the ease and exactness of their style. Omg these fabulous people are standing in front of my school, CCNY in Harlem. I am a fan of old photos and am so blessed to have pics of my grandparents, who were quite daper dressers. My nan made her own frocks too. Beautiful. From the second picture, I would definitely say City College of New York. FYI, the "tie bar" on the man second from left is actually a collar pin, a device that holds the two end of a collar together, and by being secured under the tie, helps lift the tie knot and angle, helping give an attractive flow. Outside of that, sart's comments are spot on. Thank you for this find. Thank you for sharing this collection of images and the accompanying story. I particularly like that you pointed out the little sartorial details I might have otherwise missed.These are indeed fascinating, on a number of levels. I agree with the Anonymous comment from 1:27pm re: this African American family's upper class and educated background being uncommon during this time period, which itself prompts even more interest than the clothing. There is so much story here. he has a wonderful grace there that reminds me of Gene Kelly, in both the style details and the posture. casual photography – lots more regular folks had cameras to document their lives (I have some studio photos from the teens & 20's, but lots of casual photos from the 1940's). Although cameras were becoming standard, posing for a picture was still regarded as something special and almost everyone looks delighted to be doing so. Maybe these photos can be id'ed through CCNY's library or archives? They seem to be of a group of students – the one fellow seems a shade older than the others, but maybe not. I don't think this is Cornell – the buildings looks similar to West campus dorms or Balch Hall, but not instantly identifiable. 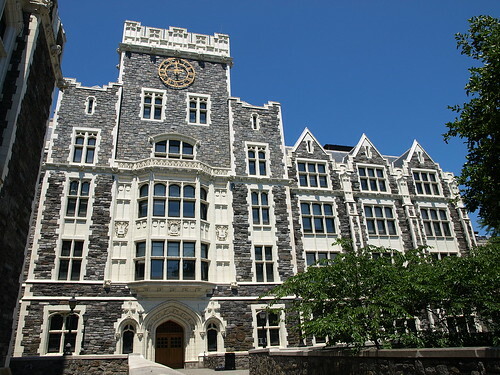 If it were Cornell, Yale or Duke, however, identifying them would be easy as there were not a lot of African American students at the time – would that be true of CCNY also? The buildings are the right height, right kinds of trees and lampposts. This also makes immediate sense of the dress. Too warm for Duke, rather eastern for St. Louis, no? Definitely urban. And there is a sense of place in these photos as well. Are we in West Philadelphia? Just a hunch about the buildings in the background, is it the old Quad at the University of Pennsylvania — South of Spruce Street between 36 and 38th? i would wear that dress everyday! lovely! Such sophistication and elegance you don't see much of today. I love the old photographs! Graceful, hopeful way to start the new decade! What a happy new year's present! These people exude a natural pride and grace–truly comfortable in such beautiful style. It's a good reminder that fashion at it's best should not look forced! i LOVE these vintage photos scott. comfortable you can tell they are. These images make me nostalgic for a time when people took great care with their appearance, no matter the occasion. Now, sadly, people feel that it is OK to even go to church in gym clothes. It seems the vote is hands down City College in Harlem – although I was originally convinced it was the Princeton campus! Love your blog, thank you for sharing your inspiration with us. And a very lovely 2010! It seems hands down the vote is City College in Harlem (I will have to get uptown to visit) – but I was originally convinced this was the Princeton campus! Love the blog, thank you for sharing your inspiration with us. And a very lovely 2010! I thought City College as well. It is a nice looking building. Great first post for the New Year. Happy New Year Sartorialist! These people look like they could have been friends with my deceased relatives. When I see certain young black people dressed in a messy hip hop style it's upsetting because I've seen how stylish black people can dress, even ones without a lot of money. They don't look cartoonish, they look classy. The latter 3 photos (and likely the first couple as well) were definitely taken at UPenn in Philly. That brick building is the Quad–in one picture, they're standing inside the Upper Quad in front of the main gate, and in another, the woman sitting by herself in front of the railing is in front of the McClelland Hall balcony. 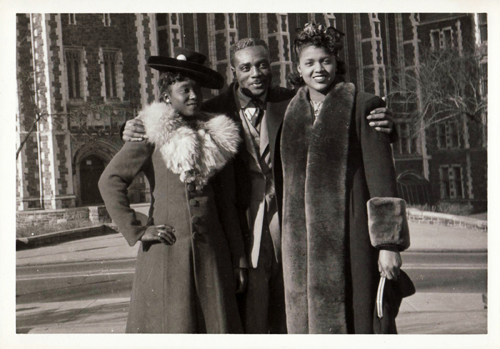 I bet the ARCH (multicultural resource center) at Penn would have some more info on these stylish people. It is always amazing to see not only how much clothing conveys ones dignity but ones joy. I'll check through some photo archives to see whether I can ID the mustached man who is in most of the photos. If he can be ID'd, you have a valuable set of photos. The man at the far right in the third picture looks very much like a young Percy Sutton. The wide lapel double-breasted jacket would suggest early-1940s. Such beautiful photos. I have some shoes exactly like the guy's wearing in the photo second from the bottom. They were originally handmade in Jamaica. I found them in Portobello and they were small enough to fit a girl. They're very cool. I'm a history teacher and my mom just gave me some old family photos where some distant cousins from the 1920s. They are dressed as flappers and have the bobbed hair. It's great. That's why I love being a history teacher, we not only teach about dates and people, but style and attitude too, at least I try to in my classes. This black and white series is inspired. Showing such style in this time, I'm jealous I didn't think of it. just lovely! great clothes and apparent joy in dressing. school records. perhaps identity cards? Being from an African American, I can feel like some of the answers to your questions rest in history. Recalling my Grandmother's stories about how her mother dressed her, having nice clothes during these times was a way of distinguishing yourself away from the racial expectations for you. If you were groomed well it meant something different to live in American society during the 30s and 40s where Jim Crow was in that national vocabulary. To this day my Grandmother has held onto her clothes for the same reasons. She dressed to impress to fend in places where you could be discriminated against stays with you. But dressing for her is something entirely personal for her for all of these reasons. You might find reason to say she's rat packing all of her clothes, but they stand for some of the reasons that I think the people in these pictures dressed the way they do. Historical reasons. The building in the photos is Shepherd Hall, the original centerpiece of the lovely campus. Unfortunately there is now the eyesore of North Academic Center dominating the west side of the campus. But it is still an idyllic place for NYC nonetheless. Anyway, the school used to be famous for being essentially the Ivy League of minorities when the Ivies were for the most part, strictly WASP. As for them looking so sharp, we must remember that back in the day people used to make an attempt to look sharp at universities. Unlike the Uggs and sweatpants combos I'm sure we all know exists today. The history if CCNY is rather interesting if anyone cares to look further. Also, once spring rolls around it is well worth taking the train up to 137th for a cup of coffee and lunch on the campus to admire the architecture and open space. Oh, I agree with all those who encourage you to post more photos of this family and other stylish folks of the past. I tell my own children all the time that by dressing stylishly and carefully, you are giving a gift to those around you. A fleeting gift, but a potentially inspiring one nevertheless. By showing all of us these photos, you renew the gift these delightful people gave. Thank you for bringing them back to a very appreciative audience. Love these. What an elegant group they are. Do include vintage photos again in the future. Fashion truly is timeless! Very often I find myself wishing I'd been born decades before. This image reinforces that! WOW! This family was clearly The Huxtables of their day! wow, these photos are gorgeous! great find! :-) That brings another thing to my mind, I just bought your book, and what did I find but a photo from a photo session I once found in Elle a long time ago. I ripped all the pictures out of the magazine and saved them because I found them so beautiful… I still have them, but didn´t make the connection with you until I recognised one of them i your book. Would love to see more of this kind of thing on your blog. Great photos. All style apart I find very funny the guy sticking his tongue out on the second picture ! I love, love, LOVE, this kind of research. I'm sure, with your viewership, that someone will come forth. I'm in agreement that that is definitely a University. How gorgeous! These guys were clearly one stylish family! These pictures are beautiful. I hope you do manage to find out something more about these people; I'd be interested to know some more about them. the first photo appears to be printed backwards, if the flowers in the lapels and the watch on the right hands is indication. I wish people still dressed like this. Thank you for this post! A very stylish family indeed. @ God's favorite, I didn't get pimp at all from these gentlemen. This is an intersting saga to be continued..thanks again Sart and welcome back. 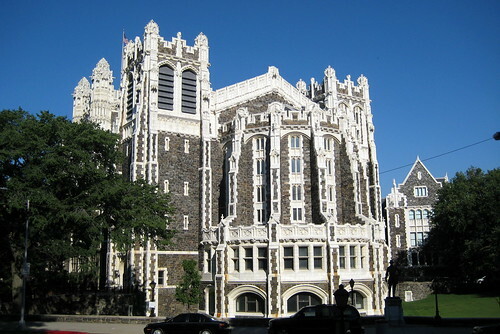 Most of those pictures were shot at CCNY-City College of New York in front of Shepherd Hall on 137th and Convent Ave…. for anyone wondering!!! P.S. I looove these photos… such timeless pieces. what an impeccably dressed family! this just shows that classic dressing never goes out of style. Scott- check out http://www.bighappyfunhouse.com….Ron Slattery's site..that's ALL he does is collect and post old interesting vernacular photos! Great site!!! Interesting how many colleges have been "positively" identified! Generic college architecture I suppose. On two points, I'm voting for 1949+, maybe as late as 1952. There was a shortage of film during the war years so the post war explosion of interest in photography makes post-war likely. Stylistically, what about the lapels? Very wide, and draped pants. The plaid dress seems to have a circle skirt so that seems 1950ish to me. And yes! I thought of Percy Sutton too! THESE ARE GORGEOUS PHOTOS. I AM DROOLING AT THE EASY ELEGANCE. THEY LOOK LIKE MY PARENTS! FOR MY GGENERATION, FACEBOOK HAS TOTALLY RUINED HOW WE POSE FOR PHOTOGRAPHS. BUT WOW! I'M MESMERISED! Wonderful – please do make this a regular feature! uh honey! these are an AMAZING FINE! i do hope "old" photos become regulars on your blog! Madly awesome!!! Puts anything I try throwing on today to absolute shame! I am not wortrhy, I am not worthy! Well, apparently there's some debate over this, but it certainly looks like the quad at Penn in Philadelphia! from a time when ppl didnt dare leave their homes in jammies..!!! UGH! How lovely that these photos were found by someone who gave them the appreciation they deserve….thank you for sharing. but that is definitely City College of New York in Harlem, I go there right now! People were a lot more stylish back then haha.. This entry is probably my favourite since Handball in Brooklyn, not only are the clothes fabulous (i want the coat lined with fur cuffs! )but there is something completely marvelous in the facial expressions in the photos, they truly capture a completely different time. SCOTT! You look too much into details. Lol, but it's these subtle nuances of people's hand-picked outfits that makes this blog so special. I love these photos, thank you for being cold and riffling through that box, Scott. I used to look for old photos in antique, or so called antique, shops and thrift shops. I do have the patience, but I like to have a chair at hand when I go through the boxes.. I've found some wonderful photos and postcard photos (sometimes with very elegant writing from a place far far away). It can get to be an addictive search. Luckily (I say this sardonically) I now live in a city without much in the way of these kind of shops, or flea markets. These are so elegant! What a lucky find. I love to see the way people used to dress; people don't dress with enough style anymore. These photos were most definitely taken at the University of Pennsylvania!!! I am currently in the middle of my junior year at Penn. I am also a Black American and I love vintage photography (vintage photos of Black Americans are hard to find). I am simply enamored with these pictures and will ask around about them. I have been a fan of The Sartorialist for quite some time now (I have it bookmarked and check the site often) but I just fell in love with this site all over again. This made my day! The shoulders' of the woman's dress in the final photo date it as 1940s too. That is one SHARP group of people! I think I might just be the female-aussie-cupcake-baking-vintage-clad version of you! I used to live in New York and spent hours pouring over all the lovely boxes of photos at the chelsea flea market! I heard it was moving when I left so I'm glad to hear it's still alive and full of buried treasure. I look forward to seeing more of your discoveries. This family has such amazing style. I wonder how these beautiful photos end out in a flea market…. I love looking at their eyes: maybe some pain, definitely pride and [email protected]# loads of intelligence. Photos capture social history – the styles of clothing (and their congruence or not with the environment/architecture), the hairstyles, the economy, the technologies and values of the day etc. I have inherited many photos of ancestors in their finery, which together with collectables from their era, form a strong picture of times past. Additionally these photos are a resource for designers and historians. I would never think of photographs (or photographers) of people/fashion as anything but valuable. Definitely at City College. Probably younger in that one photo because it was him starting college, then later they're dressed up for his graduation! Probably a family from Harlem. Gorgeous photos! They are definitely taken at the City College campus in New York City. Wow beautiful photos, love they way they tell a story but at the same time you as an audience can draw your own conclusions about who you think they were/are. Especially love that last shot of the lady; so vintage and pretty. I love vintage photos! that is definitely a college campus in the background. It would be nice if more people these days made an effort to look more dressed up when going out. Today if you go to a college campus you feel like you're in a giant slumber party. I've never felt compelled to comment on a post on this blog until today. Great photos! My roommate and I search for old photos in antique stores and flea markets. We often wonder about the families and their stories. We have a great one of a young girl in a beautiful dress playing the violin. Please share more of these types of finds. So refreshing! I'm surprised no one has said this yet–the man who is in most of the photos is FINE! If he was a teacher, I bet there was an army of coeds with crushes on him. He looks especially good in the photo where his sleeves are rolled up–the tiny waist and broad shoulders…swoon! Clothing wise it could either be Duke, CCNY or Washington. I've visited all three and it gets cold as hell in all three locations. Playing the odds, I would say CCNY, being that it is in the midst of what used to be a premiere middle class black neighborhood but heres the catch…Durham (Duke area) was a hotbed of middle class blacks too..little known but true…in any event..they look great. This does look like city college at 137th and amsterdam ave.
i just moved to this neighborhood. I love it! you should come check it out on sunday after church – but wait till spring when the trees on convent ave are in bloom. there are amazing styles still going on up here in harlem. and amazing architecture!! This is treasure…people who take care in their appearance…the essence of being soignee is palpable here…pow! what a find. Thank-you for sharing. Oh my gosh, the HATS on the women! Amazing. I think we're due for a hat revival. Wonderful! Everything looks better in black and white photos. Please make vintage finds a regular feature. this post makes me want to drink spiced cider and sit by a fire and look at old photos. thanks for this creative departure! this mysterious family is so radiant. These photos look like they were taken on the City College campus in Harlem, NY. I love the photos- they say so much about the subjects and their sense of style. As a black woman, I was so glad to see this. There was a documentary on PBS a few years ago about African-Americans and the way that they used to dress. We always used to pride ourselves on our appearance, and it seems to have gotten lost in trashy/throw away clothing and sagging pants. This is not a blanket statement about all black people. It just reminds me that I need to take great care in how I look and present myself to the public daily. Great pictures! Show a lot of history. My first hunch is that they were taken in the quadrangle at University of Pennsylvania. scott, the b&w images to "the family" photos are mesmerizing in a haunting kind of way. i too, am intrigued by them and hope you find more photos so we can piece together a story. i embace your idea bout using more old photos…brilliant! Thank you so much for sharing these! 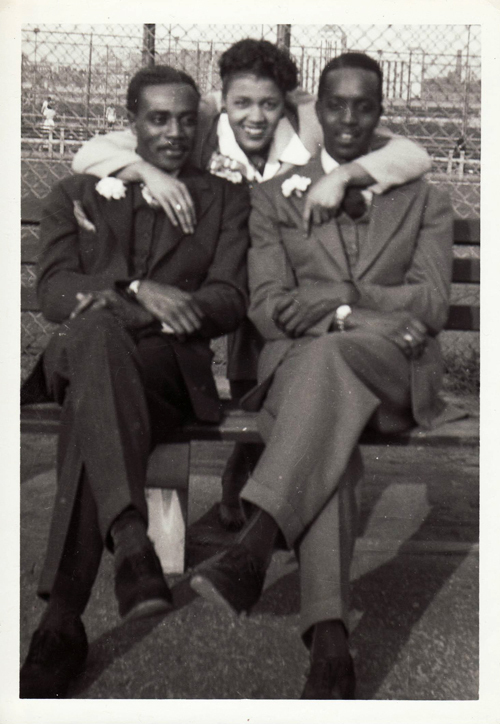 I'm a lover and collector of vintage photos depicting African American life, so I really appreciate these. These ladies and gents are the epitome of sophistication! Gorgeous! I would so wear the dress the woman is wearing in the last photo. Beautiful. this post is magical! so much is left to the imagination. can't wait to see more like this. Did anyone see "The Scurlock Studio and Black Washington: Picturing the Promise" exhibit at the Museum of American History in DC? These photographs remind me of the work exhibited there. If anyone is able, get out and take a look. Its a great reminder that photography not only records fashion of the time, but the climate of time- change, hope, respect, love- its all there. That is what I love so much about your work, Scott. Your photographs provide a glimpse into the climate of the world today through fashion and backdrop, posture and pose. This is a great post. I find it really interesting to look back on style in history, I hope that your pictures will be found in the future so people can enjoy the style of now. Scroll down a little to the postcard… Check out the single gable with the double gable to the right… and the fenestration matches… this may be a small clue, but its something! The fur-collared coat on the left is GORGEOUS! Ghosts of a more civilized world. thank you so much for this. it is a part of african american history that you have salvaged and honored. and yes these folks have style. thank you again for seeing us! The background seems a lot if not so like City College on 139th st. and Amsterdam New York. Wow such cool pics. They sure did have style. I love looking at old pictures, they get you thinking about how life was back then. what a treat to see these photos! how wonderful that you found them and how tragic for their children and children of children to have lost them! Oh my, Oh my! Those photos remind me so much of pictures of I have my father, dressed so dapper in his military uniform. Beautiful! It's the long goodbye…and it happens everyday…Photos never fade away…youth abandons, the body attacked by wrinkles and racked with pain, our old photgraphs offer us a chance to relive those better days. I bet these beautiful black people were from the fabled Sugar Hill. The youth need to see pictures like this to understand what they are about–this is real style. wouldn't it be amazing if someone who read this blog was related to the people in those photos. it'd really be a small world then! I believe that the gentleman's tie bar is actually a collar bar. My father wore them in the 40's and 50's. His shirt were Brooks Brothers and Hathaway and the holes were stitched in so as not to make holes in the fabric. Thats city college in the backround! can anyone shed light on the pendant worn by the young woman in the final photo? the one with the horizontal arrow? It doesn't appear to be a fashion piece of the period. Could it be a membership medallion, a political badge – or could it have some university or graduation significance? it is so unusual…. My, what beautiful people! Seeing them was almost a Shakespearean Brave New World moment for me. These photos are a great find! Kudos for sifting through and finding some gems of style. Chelsea St. Flea Market is a gold mine; my buddy Mike Miller sells antique oddities there ever Saturday, the best weird stuff in the universe. Very moving post indeed. Reminds me of French artist Christian Boltanski (see his "Personnes" show at the Grand Palais in Paris until Feb 21). He works on oblivion and disappearance. How one's passage on earth can be resumed by a bunch of clothes and a few pics… Ask Garance to take you there. I have a feeling you might love it! Thank you anyway, beautiful post. I, too, think these photos are lovely. Man, do these people have class! Thanks for posting these. Can we ever return to such an era? So neat! Love those, thanks for sharing. Beautiful photos, looks like just Wellesley College in MA. Love that its a series of the same family. Im dying to know what their life stories are. The thing that goes best with all these great clothes is their expressions – smiles! I do miss the days when you were expected to dress a certain way for a certain occasion, location or season. Self-respect.Like someone pointed out, most of our clothes consist these days of washed out cottons. Sadly, true, for me too. The days of affordable quality are gone. Or maybe we all just buy too many temporary clothes? Oh one more thing: corsages? So cool. My grandmother had a few special ones saved in a drawer in their original florist boxes. These photos brought that scent right back. A scent which I now know was gardenia. I think corsages are another thing we might not see again on anybody young. Too bad. This is the kind of look my dapper grandfather was always aspiring to. It still looks great. Thanks for sharing. My God, these pictures are amazing! This family is absolutely classy and gorgeous. It is ART. but i love that this clue means the photos are most likely a local harlem family, taken on the first day of university. or maybe they just walked up st. nicholas to take photos in front of the beautiful facades? ah, it's fantastic! I too am a vintage/antique/history addict. These are so much fun. I love decoding things and trying to figure out dates and places… Soooo much fun. I feel like I may be the last generation of young'ins that may care about things like this… I'm 25. I almost peed my pants when I got a Jaques Heim coat on Ebay for $40. La Mano de Dios (Hand of God)found these gorgeous photos. these are fabulous! they not only had wonderful style, but their exuberance really leaps off the page. i love how happy they seem to be with each other – a worthy reminder that it isn't all about the clothes; if you're genuinely happy, you'll shine. inspirational. thank you! A few days ago I saw more pictures of this family in the display window of cloak and daggar in nyc! They are definitely standing at the interior to the Quad entrance at the University of Pennsylvania. I could never forget my old dorm! The man on the left in the top photo is the same as in the following ones. And I believe the woman in the photo alone is the same as from photo #1. I agree top photo is transposed and, if so, that's a large diamond on her left ring finger. Maybe they just came from a justice of the peace. I don't know about over a period of years but certainly some of these pictures are in winter and at least one (in shirt sleeves) is in the summer. The same man appears pretty much in all of them, superbly dressed in all. Where he is standing in all cases is on the campus of The City College of New York I would say sometime in the late or mid 40s. These may be students at CCNY, or one of them may be a recent or current graduate or student. 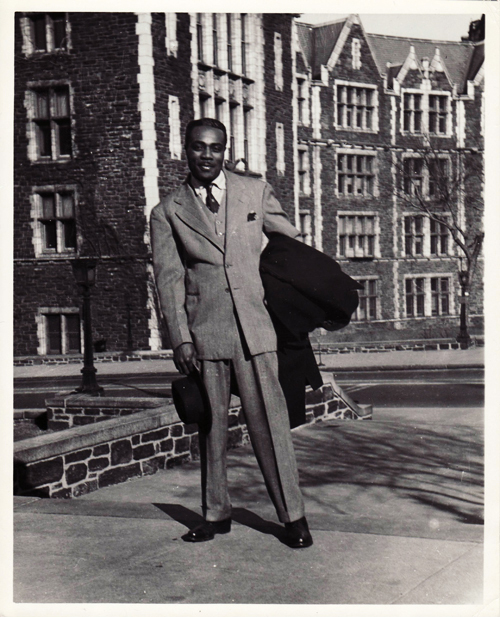 My mother was a student at CCNY in the late forties and throughout the 50s and black students were extremely rare then so it may be possible to find this guy in the yearbooks for that period. I was born in 1952 and lived most of my life a few blocks from the campus. I was a student at CCNY in the 70s and am currently a faculty member there. My association with the school ranges back over my entire life. I get the feeling that although he or someone in the group may be a student, that the purpose of the photographs was to document the clothing. During this period there were quite a few tailors operating in Harlem and blacks, especially the men, were known during this period for preferring hand tailored clothing. In the South and in other places where segregation was frequent in the stores, private tailoring and garmentmaking was a necessity. Also, one of the fields in which blacks gravitated from the time of slavery was in dressmaking, weaving and other kinds of sewing. I came from such a family. My grandmother Willi Posey was a designer who began a business around this period and belonged to NAFAD (National Association of Fashion and Accessory Designers) who began there operations at this time at the Abyssinian Baptist Church in order to contest the racial apartheid of the New York Fashion Industry then. I have posted many of her fashion photographs and clothing made by her and her ancestors at http://www.flickr/mjsoulpictures.com. It is possible that they simply chose this location because they could set up a shoot without too much interruption, and with no special permission from anyone on the campus of the college let's say on a weekend perhaps or while school was not in session. At least in the 60s when I was reading fashion magazines, college campuses were favorite locations for fashion shoots. These pictures were they glossies or snapshots? But then if they had been done for a black newspaper or magazine, they probably would have been stamped. They don't seem much like family photographs to me nor souvenirs. I do know that black male fashion was a much more serious pursuit in Harlem than it might have been in other racial communities and there were many menswear stores and tailors in Harlem. Many of them were still around when I was a kid in the 50s and 60s. These pictures seem quite purposeful but I will be looking at them more. My neice sent me this page. I love love love what you are doing. Will continue to hunt for these people and let you know if i find anything. Thanks so much for your efforts. No wonder everybody is enchanted by this project. It is a great project, a project whose time is long overdue. Thanks again. My guess of location was also City College. this is great, please make it a regular feature! I love this! Please post more!!!! What a good-looking and stylish family! the building in the background is Shepard Hall at The City College of NY. Beautiful! These photos remind me of photos of my grandparents and the rest of my family from that generation. Super stylish. I'm inspired to take to my sewing machine. It looks like City College on 137th street and amsterdam, Manhattan. What an amazing outpouring of enthusiasm. Thanks. My Parents' generation comes to mind as I viewed these. Style was ubiquitous then. The vibe was, "Look at me, Love me!". Now THESE are some beautiful people. Not this fake mess we have now. I wish someone from the family would see these photos on this website and reclaim their family history. For those of you who identified the building as City College in Harlem,NY, you are correct. The second pic was in front of Baskerville Hall. The rest are Shepherd Hall. I should know, it's my alma mater and attended many classes in Shepherd Hall. I know those CCNY buildings ANYWHERE. Ah ! – this is my school. The University of Pennsylvania – I am almost 100% sure. This is the quadrangle (aka The Quad) that houses undergraduates, mostly freshmen, at UPenn. Lovely people in the photos – very elegant! I love that most of these pictures were taken at City College in Harlem (140th Street) and that it still looks this way to this day. I'm one of those people that sift through bins of vintage photographs in search of treasures like these. Lucky find! RE: CSI discovery of the reversed negative. I don't see how "unreversing" the negative would change the location of the boutonniere. Impossible. Love this photo series, its absolutely amazing! I love the African-American Collegiate aspect. As a 21 year old African American male, who attends the college, City College in NYC, I would love for these times to be rediscovered in both style and cultural ideologies. I love to stare and just think out their lives, what they are studying, where they live, etc. You should do an entire site devoted to old photography. i love your blog, i must confess i even used your style for my blog. nonetheless, this is super, the b&w photos are classic, these are simply the best photos i've ever seen. these are the "lost photos" from the lost history. keep up the good work. I was gonna say I kinda look like one of the oxbridge college's but I can't quite put my finger on it. But I could be wrong lol. Looks like buildings at the University of Pennsylvania. All those pictures were taken at City College in Harlem. Looks like all of the photos are from the campus of City College of New York? Wonderful. They all look very elegant. That last picture definitely looks like the Balch Hall courtyard at Cornell to me. Same bench, same stone railing, same ivy-covered building. Definitely taken at UPenn!! The one of the quad gave me chills!! Gorgeous set of photos. People still guessing at where they were taken need to read the other posts. There is no need to guess. They are certainly, without a doubt, without question, DEFINITIVELY taken outside Shepard Hall at City College on Convent Ave – which is incidentally co-located with Strivers Row (the epicenter of the Harlem Renaissance.). Now, if you want to research these folks further, you know where to start. And to those who knocked it, City is still an excellent school. In particular, it's Architecture, Engineering and Sophie Davis medical programs are first rate. Anyone trash talking it hasn't been there to see what's happening. They were probably harlem-ites! During the rennassiance period! African American, I sure of it! As one myself, blacks from the north had a special attittude, they created thier own society. They were probably associated with old african American social clubs like the Links, Inc. !! I love their passion and the way they exude thier confidence thru posture! these are beautiful pictures and very classy..exactly portraying the harlem renaissance and the history and beauty of the time and place. These are definitely at City College and i actually work there, i passed by and took a picture at the same spot. Not to take ANYthing away from this beautiful family, but that's the way we did things then. My solidly middle class Ohio family circa 1948 thought nothing of dressing full tilt including hat and gloves for my mother, suit, tie and hat for my father for a Sunday family drive– to Niagara Falls, 4 hours away. We saw the Falls, turned around and drove home another 4 hours. And I never remember my father even loosening his tie. Didn't people in those times dress like this in general? I wish it would be like this nowadays though. I would love to wear a nice dress and hat everyday! But then some people do because it fits their lifestyle. Maybe I just need a change of lifestyle or win the lottery. Looks like the City College of NY campus! very cool! Amazing pics! They take me back to my youth in the 50's and early 60's when you dressed up to do things as every day as going downtown! They make me remember the style of my parents, my aunts and uncles. Thanks so much for sharing this stylish look back! I've followed your blog for some time, and this is my favorite entry thusfar. This post was a gift, I am sorry I caught it so late. Thank you for you eye, you passion. Keep 'em comin'. As a Black Canadian woman, this is a wonderful segue into Black History. 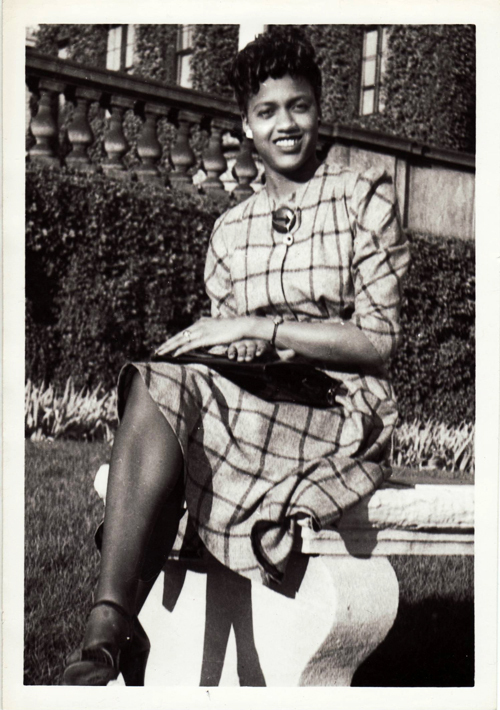 Unlike some previous posts that think this manner of dress was the exception to the rule for Black folks during the 40s, quite the opposite is true. Although all might not have had the style of this family, dressing with care, pride and style was the norm at that time for all members of society. Thanks for posting such a wonderful post. I too wonder who these people are and how the photos ended up in the flea market in a box. How fleeting those moments of life can be that we capture on film. If we are fortunate, the images endure. Agreed with everyone that location is CCNY with Shepard Hall as background. 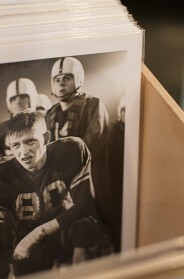 Beautiful images and quite sad to think of such family history winding up at the flea market. The buildings in the background are Shepard Hall and Harris Hall at City College of New York, 138th St and Convent Avenue. This definitely looks like the outside of City College in Harlem. Such style, and class. I love how it's natural and not forced either. It doesn't look like they were trying to "look good", rather, looking good was just their life-style, something they did, not thought about. I was captivated by these pics and have been looking for this post in vain for a while now. And here it is, thanks to the site redesign. But my search for “African-American” turned up no results, so maybe more tags would be helpful? Great new site! So nice to see this again when I was strolling through the vintages. The first one is my favorite. I’ve made up the story in my head: The woman is married to the man on the right (her left). The other is her brother; they’re very close. The lapel flowers are throwing me, though. If this is a wedding and they were in it, the official pictures have just finished. Now on to the reception! But I don’t think it is a wedding, not sure why. What other events do you traditionally put flowers in lapels? I love the way the men are both sitting with crossed legs, and hands, the creases of their pants almost touching. Both are wearing watches. The one on the left is looking at a small kid who doesn’t want to be in the picture. And I love that in the third picture, one guy’s tongue is out of his mouth. Yet he still manages to look elegant. Any idea what decade these are from? They look like high fashion from the 40′s, about? Do you know? I find myself profoundly gazing without a blink. The unknown and style is what captures me.